Americans have been enjoying the benefits of the shale gas revolution for years, most notably the unprecedented coupling of economic growth and significant greenhouse gas reductions. Now, the rest of the world is starting to see the benefits of the U.S. natural gas revolution, thanks to another once unimaginable phenomenon that WOULD NOT be happening if not for shale. The U.S. is exporting liquefied natural gas (LNG) at a record pace and will soon become a net natural gas exporter for the first time since the Eisenhower administration. As recently as 2015, the U.S.’s only LNG exports were by pipeline to Mexico. Flash forward two years, and we are now exporting natural gas to 20 countries and are on pace to become the world’s third largest LNG exporter in the near future. Some even believe the U.S. could become the world’s biggest LNG exporter within a few short years. 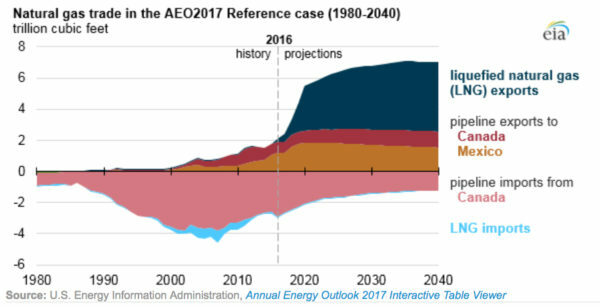 The incredible projected upward trajectory of U.S. LNG exports is graphically demonstrated in the following Energy Information Administration (EIA) chart, released in February. Considering the myriad of benefits this development entails — both globally and domestically — the U.S.’s sudden ascension on the LNG front could well be the most important story in the world nobody is talking about (with apologies to the Wall Street Journal, Reuters and Bloomberg). Again, none of this would be possible without fracking, which has led to a 50 percent increase in U.S. natural gas production since 2005 and now accounts for two-thirds of domestic production. The break-neck pace of the current LNG renaissance considered, it is difficult to stay on top of everything that’s taken place in two short years. Here is a closer look at what’s responsible for the LNG export phenomenon and why the best is likely yet to come. As the above Steelhead LNG graphic illustrates, liquefied natural gas (LNG) is simply dry natural gas that is converted to liquid form by cooling it to -162 degrees Celcius (-260 degrees Farenheit) through a process known as liquefaction. This extreme cooling reduces natural gas to 1/600th its normal volume, making transportation via ocean liner possible, allowing LNG to reach far-away destinations where pipeline transportation is not an option. Prior to being exported, the colorless, odorless, non-toxic and virtually non-flammable liquid natural gas is stored in tanks at near-atmospheric pressure. A more detailed explanation of the process can be found here. Until recently, supply was another issue inhibiting LNG trade. In fact, in the mid-2000s, some “peak gas” alarmists predicted the U.S. had “about 10 years” of natural gas left at its disposal. But that’s certainly not the case any longer, and the U.S. shale gas revolution’s role in changing that reality cannot be overstated. The Wall Street Journal recently reported that global LNG exports will likely surpass 294 million metric tons this year, up 22 percent from three years ago, and will likely rise another 21 percent by 2020, according to IHS data and forecasts. These trends are been driven by the U.S.’s sudden emergence as an LNG player. U.S. LNG exports were valued at better than $270 million this past April, a 575 percent increase from values from April 2016. Reuters recently reported that by the end of 2018, U.S. LNG export capacity in the lower 48 states will top 6 billion cubic feet per day (bcfd) — all because of the abundant supply made possible by fracking. EIA projects that number will balloon to 9.2 billion cubic feet per day by 2020. Of course, all of this makes peak gas theorist Richard Heinberg’s 2015 prediction that there “won’t be enough natural gas to enable U.S. exports of any significant magnitude” look quite foolish. The fact that we currently have more natural gas than we know what to do with might be a huge problem if not for essential infrastructure being developed deliver this gas to the rest of the world. And this exciting development is only in its infancy. 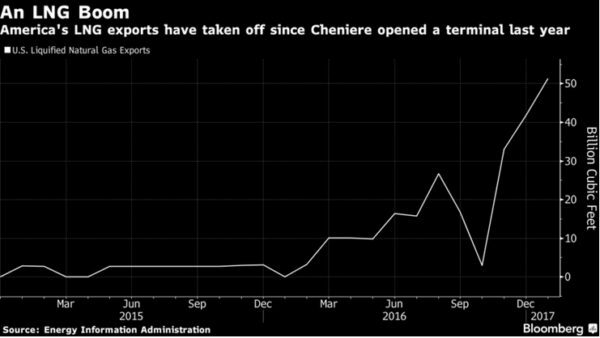 LNG exporting pioneer Cheniere opened the first-ever continental U.S. LNG export facility early last year. And though that facility is currently the only exporter of LNG in the lower 48 states, an additional 24 LNG export facilities are currently planned or under construction across the country. Four terminals currently under construction are expected to open by 2020. Seven of the new facilities will be based in Texas (Texas LNG project, Golden Pass LNG, Rio Grande LNG, Freeport LNG, Port Arthur LNG, Annova LNG and Cheniere’s Corpus Christi LNG project), and Louisiana is another hot spot. Venture Global LNG has raised $361 million for two proposed LNG export projects in south Louisiana, Tellurian Inc. is also seeking to export gas from the U.S. Gulf Coast, and Delfin LNG LLC is building a floating liquefied natural gas terminal off the Louisiana coast that will export 1.8 billion cubic feet per day of natural gas when completed in 2020. In the northeast, Dominion Energy Inc. is slated to complete an export terminal at Cove Point in Maryland online by the end of the year. The Federal Energy Regulatory Commission (FERC) has approved 11 export terminals that are either planned or under construction, and E&E News reported this week that the Deparment of Energy may start fast-tracking the FERC permitting process, which has been bottlenecked by a lack of a quorum and typically takes up to a year. This all started with the opening of Cheniere’s export facility in early 2016. As the following Bloomberg chart shows, that pioneering Sabine Pass facility has been such a success since opening in 2016 that the company is now even exporting LNG from Canada. 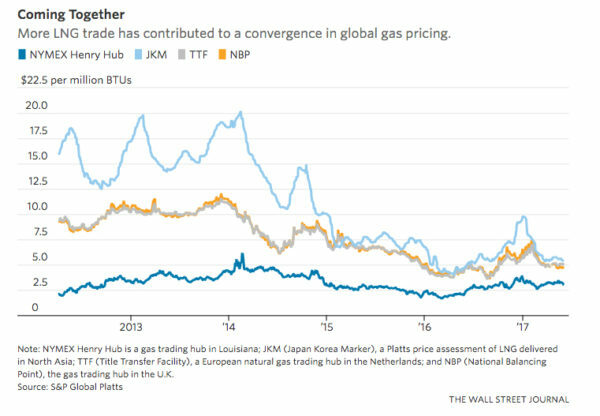 Perhaps most importantly in the grand scheme, the U.S. shale-led spike in LNG exports has started to establish a global price benchmark based on demand rather than the antiquated and wildly varied region-to-region price environment that preceded it, which was due to stringent pipeline contracts that hampered trade. In the new LNG global market, tankers are now free to re-route and ship to the highest bidder on a whim. U.S. LNG exports are truly a win-win globally and domestically, as the U.S. will continue to see an economic windfall, while the rest of the world will be able to reduce greenhouse gas emissions, air pollution and reliance on natural gas from hostile nations. Given this threat to its global market share, it’s no wonder there is evidence that Russia has bankrolled anti-fracking propaganda. Increased natural gas use worldwide could also help nations achieve the U.S.’s remarkable greenhouse gas reductions. The U.S. has seen carbon emissions drop 11.7 percent since 2005, two-thirds of which the EIA has acknowledged are attributable to increased natural gas use. A 2015 Carnegie Mellon University study also found that U.S. LNG exports could lower global methane emissions, considering Russia’s methane leakage rate is between five and seven percent and the U.S. leakage rate is just 1.2 percent, according to the most recent EPA data. A recent Forbes headline stated that “Natural Gas Is The Future of Energy, and It’s Not Even Close.” The fact that the U.S. recently signed a deal to export LNG to China, the world’s third-largest importer, is just the latest evidence. And there’s little doubt that the U.S. shale revolution is the reason such remarkable headlines are being written.